A diaper pail is one of the easiest ways to dump used and dirty diapers right in your baby’s nursery. The first thing that you need to consider before purchasing our best cloth diaper pail is how much space you have available in your nursery. Big diaper pails are a bad idea if you’re short on space. Second thing, never go for a diaper pail that could be easily accessed by a curious toddler. Always opt for a diaper pail with lids. Third and final thing that you need to consider is the type of liner used by the diaper pail. Fabric liners make the best cloth diaper pail liner because it helps with airflow and is easily washable and reusable. A nylon pail liner makes the second best cloth diaper wet bag because it can be washed with your cloth diaper laundry. 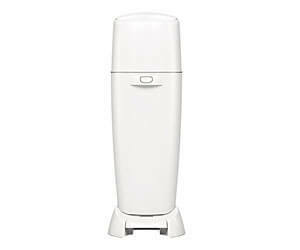 It is important to choose a diaper pail that allows air flow to prevent issues like stink or mold from happening. 1. What should I look for in a diaper pail? 2.Why Do I Need a Diaper Pail? 3. How Do Diaper Pails Work? You never have to see or smell the diaper once it is in our best baby diaper trash can. 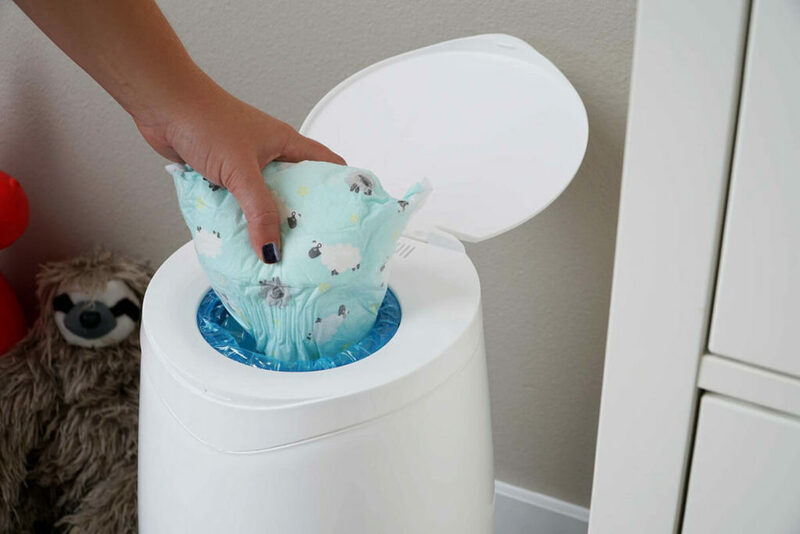 This specifically designed cloth diaper pail has Activated Charcoal filters that keep all the stink and odor away, let the moisture out, and are suggested to be changed every 3 months or so. Its tightly placed lid which is made of recycled plastic ensures that the diapers don’t create odor or fall out of the bin in case of an accident. You can dump diapers in this pail for 2 days without running out of space or you can put in diapers of multiple children because of its large size. 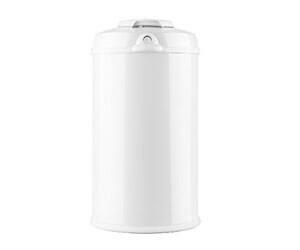 Suggested above is one of our best diaper trash can and is a must have for your nursery. 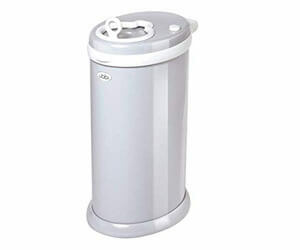 The Ubbi Steel Diaper Pail is made of powder-coated steel which helps achieve maximum odor control. Its sliding lid minimizes the air disruption which doesn’t let the stink out and is equipped with rubber seals that lock in the odor. 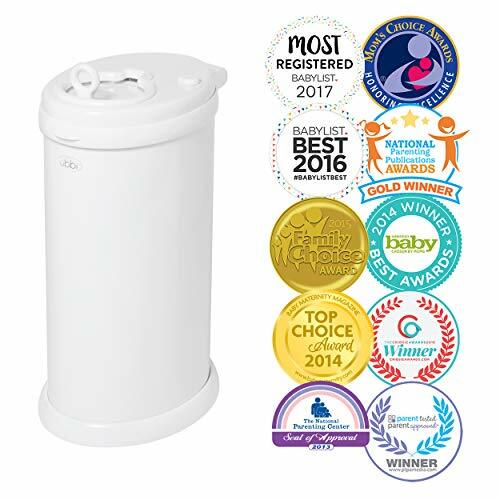 This diaper pail lets you use any standard regular or reuseable liner, or fabric liner which makes the best diaper bags for cloth diaper users and helps prevent mold. This feature makes it the easiest disposal system to use and clean. 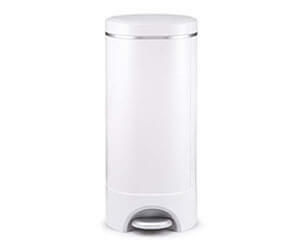 This diaper pail consists of a child proof lock and slow-close lid which makes it very secure. Ubbi Money is one of our best diaper pail for cloth diapers and comes in a variety of colors. Its sleek design and oval shape allows it to fit perfectly well even in smaller spaces and has enough room to contain 20 of the largest pull-up diapers and 55 newborn diapers at a time. Dekor Diaper Pail is designed to make this unpleasant chore bearable, if not pleasant, for you. While using other diaper pails you have to bend over to open the lid and dump the diaper in the diaper pail. But with Dekor Classic you’re not required to do any of these. You just need to step on the foot pedal to open the lid and throw the dirty diaper in. It consists of a child proof lock that keeps the toddlers away. Continuous liners allow you to empty the pail whenever required and use as much refill as you want. You cut the liner bag with the kid-safe cutter placed inside the access door, remove, and tie a knot in the remaining pail to form a new bag. This helps prevent waste of a full bag when the pail is partially full. The effective triple door control locks smell in the pail. The spring-loaded trap door shuts right after the diaper passes through, then rubber gaskets on the trap door and the top lid seal the odor inside the pail. The refillable liners with pleasing baby-powder scent help neutralize the odors. These pails are made with closed-cell ABS plastic which doesn’t absorb odors or stink like cheaper plastic, neither does it dent and is scratch and fade-resistant. Dekor Classic Diaper Pail is one of our best cloth diaper pail and can be used with Dekor Cloth Diaper Liner which is best diaper pail liner for cloth diapers. Ultimately, our best trash can for cloth diapers can be used as a simple trash can long after your baby has all grown up. This Step Diaper Pail is a combination of excellent odor control with a beautiful sleek design and an easy to use step-on-pedal lid opener. 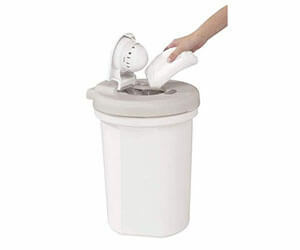 This diaper pail works great with refill rings as well as snap, seal and toss refill bags. This diaper pail consists of an odor-busting duo of lavender scented (Arm & Hammer) baking soda and self-sealing technology that seals in the odors by twisting the refill tightly as the lid closes. The lavender scented Puck absorbs the odors continuously when the pail is not in use and keeps your nursery’s aroma pleasant. Additional refills are sold separately. 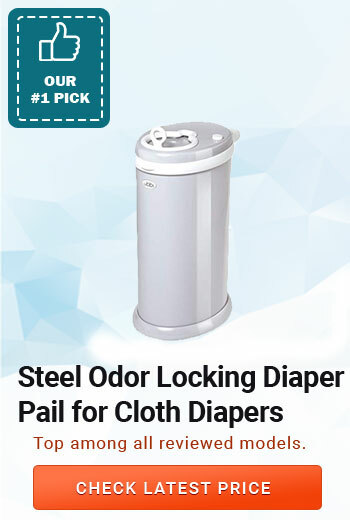 This diaper pail is made of steel and aluminum which is a good odor locker and doesn’t absorb odors like plastic. Its lid consists of a strong and flexible rubber seal that lock in the odors tightly and prevents any leaks. Its anti-slip bottom prevents it from tipping over and scratching wooden floors. Most importantly, it doesn’t require special trash bags, any regular or standard cloth diaper pail liner would work perfectly and helps you save a lot of money. It contains a safety, child-proof lock that prevents children from messing with the diaper pail. Long after your baby has grown up you can use this as a regular long-term trash can in your kitchen or bathroom. 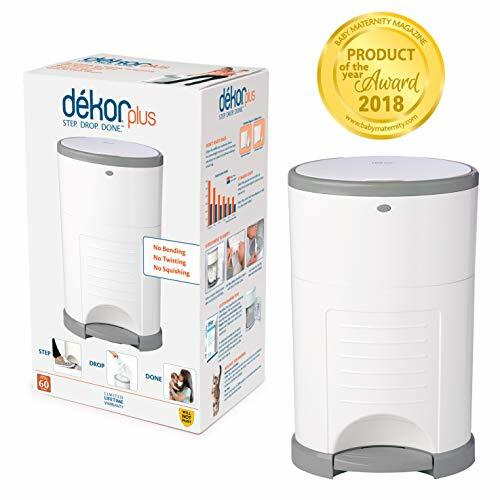 Dekor Diaper Plus Diaper Disposal System stores dirty and soiled diapers in an effective odor-free way without requiring any extra effort. Its step-on-pedal lid opener only needs you to step your foot on the pedal to open its lid and dispose of the dirty diaper. Its beautiful design complements the décor of any nursery and even works as an elegant trash can in the kitchen or bathroom when it is no longer needed for diapers. 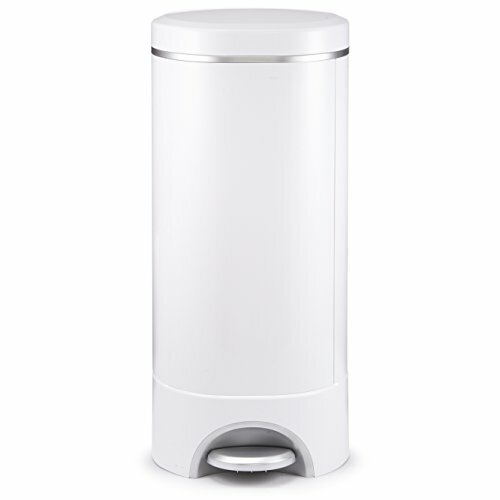 This diaper pail has plenty of room that holds up to 46 diapers before a bag change is needed. 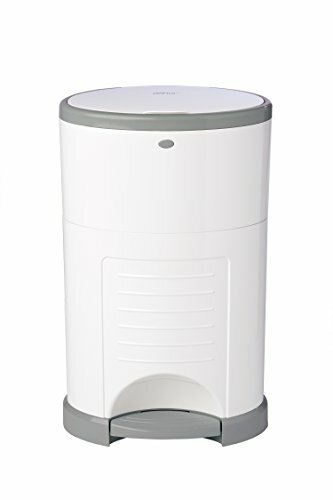 This diaper pail is made of scratch-resistant ABS plastic that can be cleaned up with bleach for hygiene. It also contains a built-in, liner cutter on the access door for easy removal, tying and disposing of refill liner, and odor-free triple seals. It comes ready to use and requires no assembly. It’s uses Dekor Plus Liner refills which are sold separately. This easy to use diaper pail promises a convenient one hand diaper disposal. It requires no turning or twisting, you just have to open the lid, drop the diaper in, close the lid and go. It is made of 100% plastic and includes one deodorizer disc that locks the odor in the diaper pail. This diaper pail doesn’t require the use of any special diaper pail liners and allows you to use standard liners or plastic bags which helps save money on costly refills. This uniquely yet beautifully shaped diaper pail comes with a hands-free, step-on-pedal operation with a gently closing lid. Its inner and outer lids are double sealed. 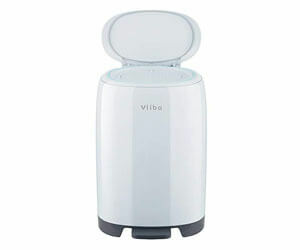 Vliba Diaper Pails come with up to 6 months’ supply of extra strength scented refill bags (112 newborn diaper count). These refill bags are replaced via a large access door and don’t require any rings or cutting of pail liner with a blade. 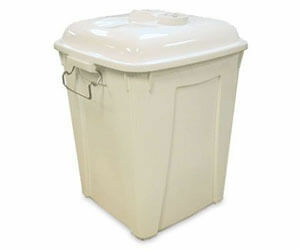 This diaper pail comes with a sample of 25 individual diaper disposal bags which are great during a quick diaper change. This diaper genie comes with the ultimate odor lock system. It features a seven layer refill bag, an airtight clamp and a front tilt for an easy bin emptying experience. It has built-in activated carbon filters which capture smell that tries to sneak out and keep the nursery fresh and odor free. The front tilt design makes the diaper bag disposal quick and easy. You are only required to pull the bag through the built-in cutter and tie a knot at the end to create a new bag. Its step-on-pedal lid opening operation makes it even better. Just step on the pedal and dispose of the stinky diaper. Its seven layer diaper bags can hold up to 270 diapers and promise complete odor lock protection. 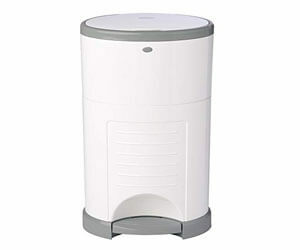 This diaper pail comes with a rotating lid which only requires one hand for diaper disposal. 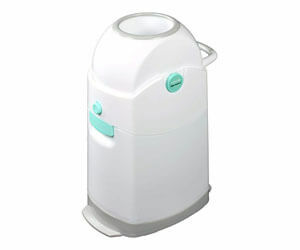 Its unique piston system pushes the diaper and its odor into the pail which keeps the nursery odor free. It allows the use of any regular or standard diaper pail liner or trash bags which helps save money on refill bags. Here are some frequently asked questions by parents that need help deciding which cloth diaper pail to buy for their newborn baby. Before you purchase a diaper pail you must consider the space you have available in your nursery, your budget and the diaper disposing style of the diaper pail. There are a lot of features that you must consider before buying our best cloth diaper pail. Bag changing process: Some diaper pails have an incredibly complicated bag changing process. Look for the one where you need to put the least effort and which is easy to figure out, such as snap, seal and toss which only requires you to tear the used bag from rest of the liner, tie a knot and throw it away in the laundry or garbage. Ease of use: It’s useless if it isn’t easy to use. Always opt for the one that requires the least effort such as the one hand disposal diaper pails or step and drop diaper pails. Step and drop diaper pails are extremely helpful because they don’t require you to bend over to open the lid. 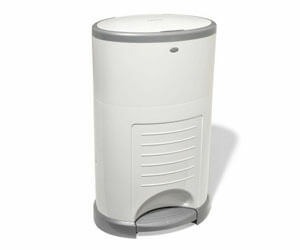 Odor prevention: A diaper pail must have an excellent odor locking system. Some diaper pails come with scented refill bags, odor prevention filters, and scented baking soda pucks, or odor locking discs that keep the nursery smelling fresh and sweet. You’ll be amazed to find out how convenient and handy diaper pails are when you have so much stuff on your hands to deal with. You can’t go throw the diaper in the trash can or put it in the laundry for washing every time it gets dirty. You need an odor free, safe space to put away dirty diapers so you can deal with them later or whenever required. 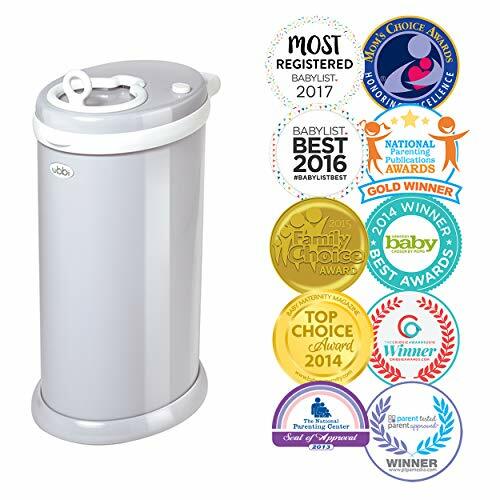 The most important feature of a diaper pail is that it provides an odor free space due to its tightly placed seal to store your dirty diapers, which is way better than a regular trash can. A good roomy diaper pail stores diapers for almost two days without needing a bag change. A large number of cloth diaper pails made of different materials are available with different features. To look for the right diaper pail for your nursery is of extreme importance. It requires thorough consideration of your requirements and resources. Diaper pails that are made of metal or ABS plastic seem to be a better option than diaper pails made of regular plastic. They have strong odor prevention features because they don’t absorb odors like regular plastic. A diaper pail that complements the décor of your room or nursery is important. It should fit in well. Some diaper pails can be used as trash cans after your baby has grown up and the diaper pail is no longer needed. A good diaper pail is essential and it comes in handy when you’re a new parent and it definitely goes a long way.